I created this natural flu shot alternative to help knock out cold and flu viruses right when you feel them coming on. It’s like extra insurance to help speed up your recovery, and you won’t believe how powerful a few simple ingredients can be! 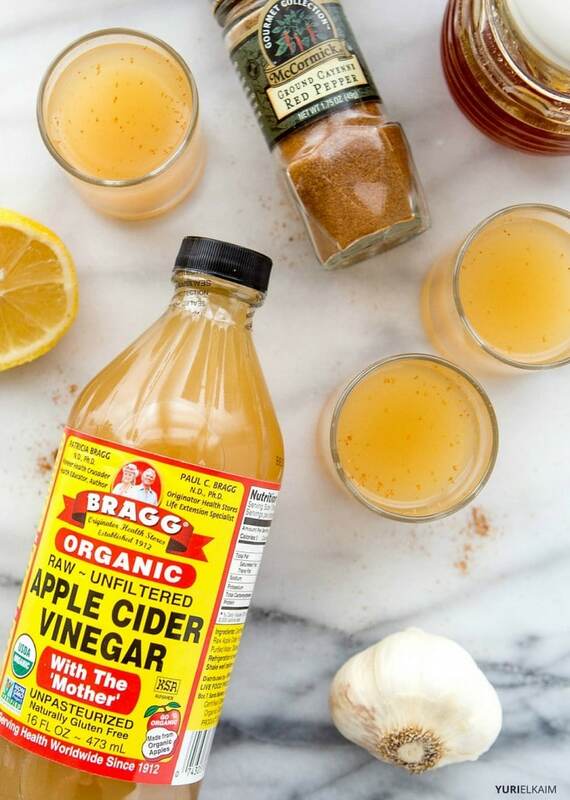 Chances are, you already have all the ingredients for this natural flu shot remedy right in your kitchen. If not, a trip to a natural foods store or even your local grocery store will have you covered. Garlic is known to relieve the flu, colds, ear infections, and other seasonal illnesses as well. Consuming garlic raw is the best way to take advantage of the antibacterial and antiviral properties, but due to its strong flavor, we advise consuming raw garlic with honey to take the edge off. It’s completely amazing that garlic is 100 times stronger than antibiotics! It works inside the body by stimulating white blood cell production and rallying them to fight infection. A 2012 study found that diallyl sulfide, a compound found in garlic, was far more effective at killing campylobacter bacteria than two common antibiotics. Make no mistake, this everyday ingredient is powerful stuff. If you already have apple cider vinegar in your pantry, check to make sure it’s unpasteurized, unfiltered, and still contains the “mother”. The “mother” contains strands of proteins, enzymes and friendly bacteria. The beneficial enzymes in apple cider vinegar are thought to displace some of the harmful bacteria in your body, which is just what you need when you feel a cold coming on. You’ll notice that the ingredient list for the nature’s flu shot calls for Manuka honey, which is imported from New Zealand. It’s a bit pricey, but it’s definitely worth it to purchase this type of honey, which has powerful antibiotic properties. It may be tempting to buy a less expensive variety of honey, but studies have shown that Manuka honey holds remarkable antibiotic and antibacterial benefits, and it’s proven to be effective in fighting infection and promoting healing. (But it comes down to making it – so if all you have is regular raw honey– that’ll still work well, too). Manuka honey is used in hospitals around the world when standard treatments for wound healing aren’t working, and that’s pretty amazing. This “nature’s flu shot” is also loaded with vitamin C from fresh pineapple juice and lemons. You probably don’t know this, but pineapple actually has more vitamin C than an orange! One study found that regular vitamin C consumption reduces the severity of cold symptoms, which is why I loaded this drink up with vitamin C rich fruit. It’s thought that vitamin C increases production of white blood cells, which are instrumental in fighting infections. The last superstar in the nature’s flu shot is cayenne pepper. This potent spice works on mucus to break it up and keep it moving, so congestive symptoms are relieved. It also gives this natural flu shot a little kick from the heat to keep you on your toes. The best part about this drink is that it’s quick to whip up in the blender, and it’ll act fast to have you feeling better in no time. 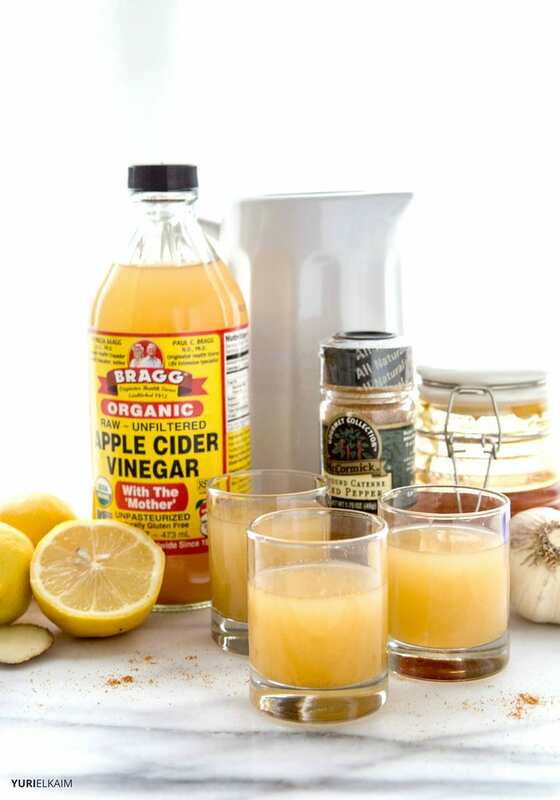 This drink will help knock out cold and flu viruses right when you feel them coming on. It’s a little extra insurance to help speed up your recovery. You won’t believe how powerful a few simple ingredients can be! Place all ingredients in a blender. Puree until smooth. Drink a 1-2 oz shot every 2-3 hours until symptoms subside. How often should I drink this? If you feel like you’re getting sick, use this homemade tonic as you would Emergen-C. A small (1-2 oz) “shot” of it every 2-3 hours for the first 24-48 hours will give your body an extra boost. Along with this, I also recommend steering clear of sugar and other processed carbs and consider accessing additional health-boosting benefits with intermittent fasting. What if I don’t like the flavor? No worries at all. You can still enjoy all the same benefits by adding a small amount to a cup of tea or adding a little more juice to make the flavor palatable. If worse comes to worse, simply add 1-2 teaspoons of apple cider vinegar to sparkling water and sip on that throughout the day. How long does it store? If you’re making fresh juice (as suggested in the recipe), enjoy within 4-8 hours. If you’re looking for a longer-lasting natural flu fighter to keep in your fridge, try my Bonfire Cider natural flu remedy.